Cassandara Wilson returns to her Mississippi blues roots! 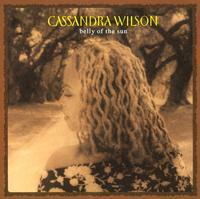 Blue Note released Cassandra Wilson's album Belly Of The Sun in 2002. The album, which was recorded in the Clarksdale, Mississippi train station, features a guest appearance from India.Arie for the song "Just Another Parade." "Returning to her Mississippi blues roots, singer Cassandra Wilson interprets the stories like no one else can. Her warm, contralto voice hypnotizes. Surrounded by the natural sound of her 6-piece touring band, Wilson settles in for a refreshing look at Americana. Plaintive guitar cries and hands-down percussion provide a natural landscape. Steel pans, dobro, hand drums, and gentle, foot-stompin' rhythms give her traditional session credibility.